A new leaked document shows a very scary route the EU wants to take with links on the web, one that would hold a site owner liable if they link to any content that infringes on someone’s copyright. 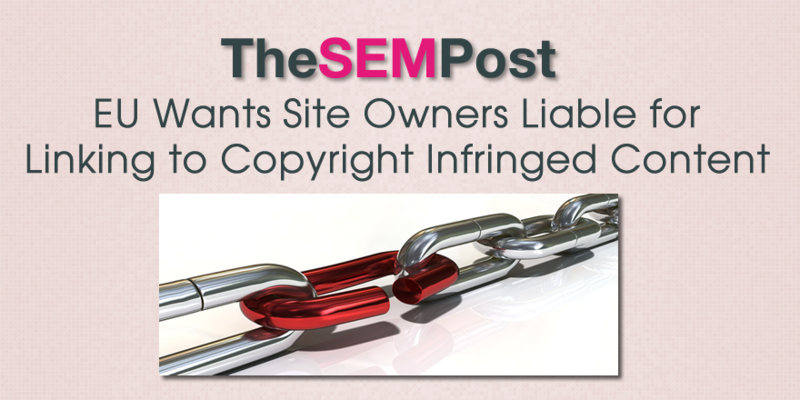 Yes, a site owner could be liable if someone else they happen to link to has stolen content on that page, even if they had no idea if was stolen. This means that publishers – or anyone who publishes anything online, whether it be for business or a personal blog – could also need to consult a lawyer for every link they make, to know it is “safe” to link to. Julia Reda, a member of the European Parliament representing Germany, wrote on her site about the leaked draft on copyright reform and it could have a profound affect on the entire internet. According to a draft communication on copyright reform leaked yesterday (via IPKat), the Commission is considering putting the simple act of linking to content under copyright protection. This idea flies in the face of both existing interpretation and spirit of the law as well as common sense. Each weblink would become a legal landmine and would allow press publishers to hold every single actor on the Internet liable. Boing Boing puts it even more succinctly. Take Boing Boing: we’ve made something like one million links over the years. Even if we’d been able to pay lawyers to review every page we’d ever linked to, we’d also have to pay layers to continue to review all of those million pages regularly, to make sure that none of those pages had been updated with infringing material. It’s a grotesque perversion of copyright, which gives creators the right to control who may copy and display their creations, expanding this right to encompass who may factually state the location of copies of those works. It also puts pressure on webmasters. Especially for large sites, and especially ones that cite sources and attribute links regularly, suddenly they could be liable to content on any one of those thousands or millions of links. Not only that, they would be liable even if that linked content changes in the future. The leaked text is not a law proposal, but just a summary of the Commission’s plans for next year. The plan is supposed to go public on the 9th of December. Affecting change in the now-known versions is nigh impossibly until then. But sometimes controversial proposals are leaked to test them – if there is no protest, the plan can be unworriedly pursued. While it could be an attempt for the Commission to gauge public reaction by leaking this information early, the fact this is even on their radar is very scary to anyone who links to a website. And while this seems too crazy to possibly pass, many people are taking the threat very seriously, particularly because of the severe implications this could have on the entire web.